Front row, from left, Sam Brannon, team manager, Addisyn Smothers, Tessa Alvis, Sarah Parris, Destiny Walker, Natalie Jefferson, Brie Ory, Kaylee Brummett. Back row: Head Coach Kayla Woodard, Assistant Coach Pam Wilkins, Callie Crider, Savannah Manley, Sunny Snoddy, Macey Butler, Gracie Manley and Susie Brewer, junior varsity coach . BIRMINGHAM - It was a fight to the finish Thursday, Nov. 1, at the Bill Harris Arena at the Crossplex in Birmingham. 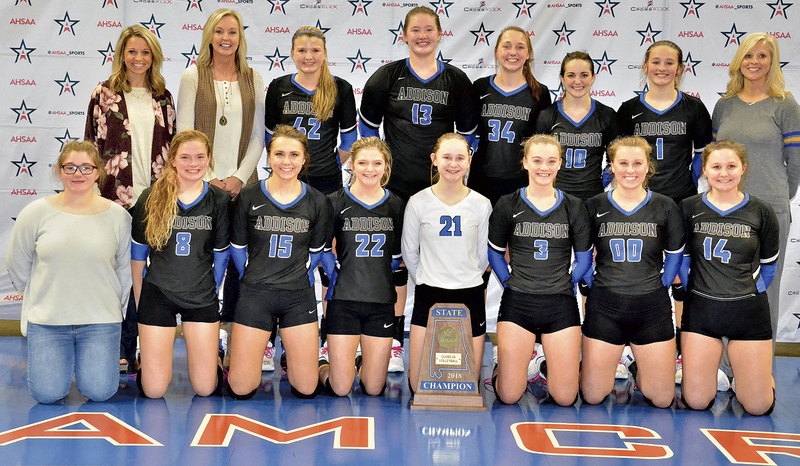 The Addison Lady Bulldogs made it six state volleyball championships in a row. The Winston County Lady Yellow Jackets took it to the fifth set, at one point leading two sets to one. Last year, Addison defeated Meek in the finals in 1A.